Full step-by-step solutions are provided online. Supports students at every stage of their learning with graduated exercises that build understanding and measure progress. Build reasoning and problem-solving skills with practice questions and well-structured exercises that build skills and mathematical techniques. Supports students at every stage of their learning with graduated exercises that build understanding and measure progress. Coverage: The practice workbooks cover all Pure, Statistics and Mechanics topics, reflecting the style of questions seen in the summer 2018 exams. The Workbook provides focussed revision sections, extensive exam practice and guidance on Edexcel's 'Large dataset' a new exam requirement from 2018. 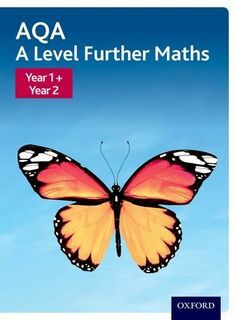 Written by a well recognised author team of experienced teachers, this book supports the major changes in assessment style. We will be planning the second year at a later date. Designed to be used flexibly, the practice books are fully mapped to the scheme of work and textbooks so you can use them seamlessly in and out of the classroom and all year round. Use them lesson by lesson, topic by topic, for homework, revision and more - the choice is yours. Written by a well recognised author team of experienced teachers, this book supports the major changes in assessment style. Great value practice materials that are cheaper than photocopying, saves more time than independently sourcing questions and answers, and are all in one place. Supports students at every stage of their learning with graduated exercises that build understanding and measure progress. No login or registration is required - just supply them with your activation code, which you will find in your management controls, and that's it. Practice at the right pace: Start with the essentials, build your skills with various practice questions to make connections between topics, then apply this to exam-style questions at the end of each chapter. Designed to be used flexibly, the practice books are fully mapped to the scheme of work and textbooks so you can use them seamlessly in and out of the classroom and all year round. Designed to be used flexibly, the practice books are fully mapped to the scheme of work and textbooks so you can use them seamlessly in and out of the classroom and all year round. Looking for legacy pre-2017 A Level resources? Make multiple Notebooks - for different topics, characters, or themes, for example. Includes worked examples with guidance, lots of exam-style questions, practice papers, and plenty of mixed and review exercises. Fully updated to match the 2017 specifications, with more of a focus on problem-solving and modelling as well as supporting the new calculators. Reinforce Year 1 content with short review chapters - Year 2 only. Written by an author team of experienced teachers, this book supports the major changes in assessment style. You will receive a confirmation email with a link, and the link will also be on the order confirmation page. Exam Board: Edexcel Level: A level Subject: Mathematics First teaching: September 2017 First exams: Summer 2018 With over 1. Throughout the book, the explanatory text is clear and concise, with abundant worked examples to show how key techniques can be used and common pitfalls to avoid. Coverage: The practice workbooks cover all Pure, Statistics and Mechanics topics, reflecting the style of questions seen in the summer 2018 exams. 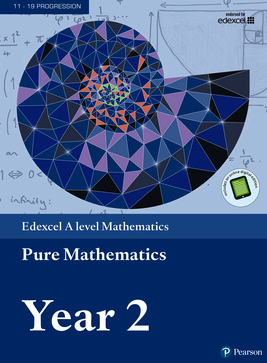 This book can be used alongside the Year 1 book to cover all the content needed for the Edexcel A level Pure Mathematics exams. Quantity: The most A level question practice available, with over 2000 extra questions per book. The Workbook provides focussed revision sections, extensive exam practice and guidance on Edexcel's 'Large dataset' a new exam requirement from 2018. Using clear and concise explanations, and abundant worked examples, it covers all the pure, mechanics and statistics content needed. Includes access to an online digital edition valid for 3 years once activated. To subscribe to Integral, visit www. Get exam-ready with confidence: Differentiated questions including 'Bronze, Silver, Gold' in each chapter, and a mixed problem-solving section for each book, will guide and help you to develop the skills you need for your exams. Reinforce Year 1 content with short review chapters - Year 2 only. Develop a fuller understanding of mathematical concepts with real world examples that help build connections between topics and develop mathematical modelling skills. Further Pure 2 replaces Pure 5 in the new specification. 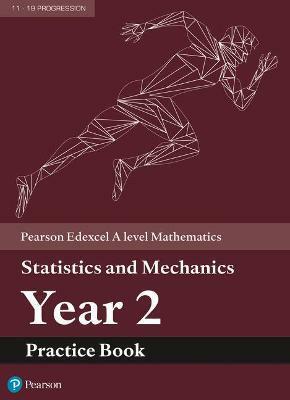 Exam Board: Edexcel Level: A level Subject: Mathematics First teaching: September 2017 First exams: Summer 2018 This book can be used alongside the Year 1 book to cover all the content needed for the Edexcel A level Statistics and Mechanics exam. Includes access to an online digital edition valid for 3 years once activated. Buy a copy per student and get them online instantly. Use them lesson by lesson, topic by topic, for homework, revision and more - the choice is yours. In every chapter, sequential exercises allow students to practise first their fluency and skills, and then the new exam-style problem-solving and modelling questions. Provide clear paths of progression that combine pure and applied maths into a coherent whole. My school will be using Edexcel, and we already have copies of the Pearson textbooks for each student. For both Single Maths and Further Maths, there will be two teachers teaching each Year 12 A Level class. 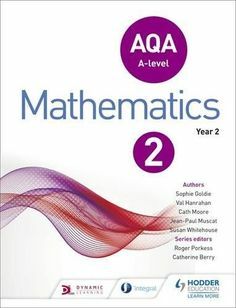 Quantity: The most A level question practice available, with over 2000 extra questions per book. Fully updated to match the new specification, with more of a focus on problem-solving and modelling as well as supporting the large data set and new calculators. 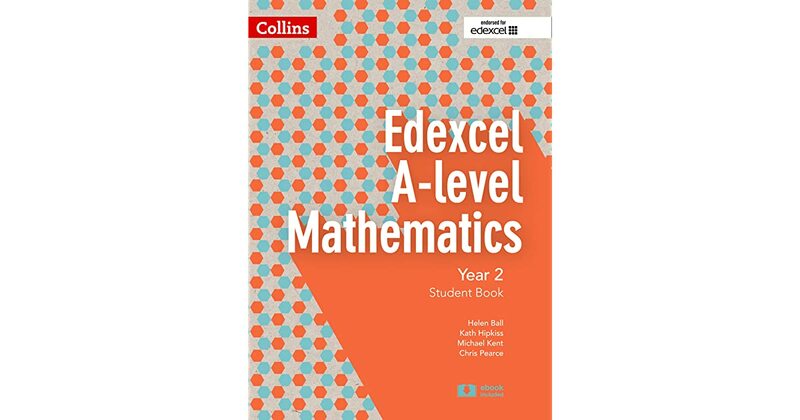 This textbook + e-book can be used alongside the Year 1 book to cover all the content needed for the Edexcel A level Pure Mathematics exams. To have full access to the eTextbooks and Integral resources you must be subscribed to both Dynamic Learning and Integral. Full step-by-step solutions are provided online. Fully updated to match the 2017 specifications, with more of a focus on problem-solving and modelling as well as supporting the large data set and new calculators. I will be developing resources for Further Pure 1 in the October half term. Provide clear paths of progression that combine pure and applied maths into a coherent whole.